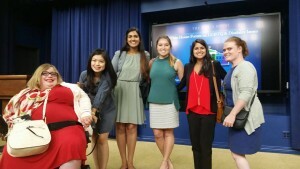 As a representative of United Cerebral Palsy’s National Office, I was able to attend the White House Forum on LGBT and Disability Issues. The event focused on the intersections between the disability community and the LGBT community. A main theme of the event was the importance of considering intersectionality throughout our advocacy and policy work. Intersectionality refers to the interconnected nature of two, or more, marginalized identities within a single individual or community. By listening to the experiences of the panelists, I learned that more often than not, individuals are categorized by others into boxes of single identities – they are viewed as either having a disability, or being a member of the LGBT community. However, the panelists stressed that people are not one-dimensional and marginalized identities do not have to be mutually exclusive. Having one identity does not simultaneously erase all other identities, nor does a single identity encompass our entire being. The panelists emphasized that we are all multi-faceted and multi-dimensional, and these varying identities intersect and interact with the others to create the essence of a person. After hearing the panelists’ experiences, I had the opportunity to reflect on my own identities, and consider the intersections that occur between them. I considered my identities as female, and as a racial minority, and explored how I believe they interact with one another. I learned that recognizing intersectionality is an important stepping stone to acknowledging and appreciating the diversity that exists among us – an essential aspect of the process of becoming an ally. An ally is an individual who is responsive to their own privilege, and actively uses that privilege in a responsible way as a basis to advocate for other communities. As an ally to the LGBT and disability communities, I was empowered by the overwhelming sense of passion and drive portrayed throughout the forum by not only the individuals on the panel, but also the attendees. I learned that in order to advocate for others, I need to continue to listen and learn about their experiences. The forum provided me the opportunity to become a better ally and advocate for these communities. This gathering created a safe space for the facilitation of an important conversation – a conversation that I hope will continue on. Although we may choose to self-identify with different communities, it is essential that we work together to create an environment of mutual respect and understanding in order to raise awareness about the issues that affect us as a collective community. Intersectionality is important to community building as well as allyship. I recognize that this is only the beginning of the conversation on intersectionality, and hopefully, this milestone will open the door for further conversations to occur in order to spread awareness, encourage understanding, and continue the strive for justice, equality, and acceptance. In our advocacy work as well as our policy work, we all need to be cognizant of the fact that people are not one dimensional. They are more than their disability, they are more than their sexual orientation, and they embody the intersection of multiple identities that all contribute to who they are as an individual. I am so thankful to have had the opportunity to attend the White House for this forum. I was able to expand my understanding on intersectionality, and hear personal narratives of the adverse effects of depriving someone of the opportunity to self-identify themselves. We live in such a diverse world, and we can all learn from the differences that exist among us. As an ally to these communities, I will do my part to create safe spaces for conversations such as this one to occur. I am hopeful that conversations surrounding the intersectionality of marginalized identities will continue to occur, and I encourage you to be a part of them. Nikita Aneja is a summer intern at United Cerebral Palsy. 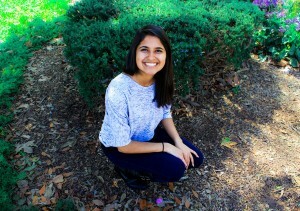 She is a rising senior at the University of California, Davis, where she is pursuing a B.S. in Psychology with a Math Emphasis, and a B.A. in Political Science. She is passionate about mental health and has interned as a Peer Counselor under Student Health and Counseling Services, as well as at Markers of Autism Risk in Babies: Learning Early Signs – an autism research study. In her spare time, she enjoys spending time with her family and friends. Her hobbies include dancing, biking, and taking her dog out for long walks.